If you are a faithful reader of this blog you are probably related to me, but also, you may have noticed that I started a yahoo group (send an e-mail to eatinglocalinpittsburgh-subscribe@yahoogroups.com if you want to join) and already I am so happy I did. I knew there had to be more to this eating local scene that what I had discovered on my own. I knew there were others out there meeting in back alleys and parking lots. And at the corner of Darlington and Denniston, as it turns out. 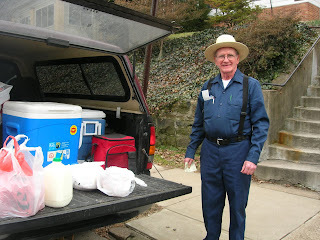 We purchased eggs, maple syrup, honey, broilers and milk. He will have pastured pork and lamb available in the future among other things. If you are interested, e-mail joe@rushacresfarm.com. Thank you for making all of this information readily available. What are your top recommendations for locally produced eggs (apologies if this is already posted)? My main concern is the humane treatment of the animal. I've become disillusioned with the labels cage-free and free-range after finding out the range of practices that can carry these labels. Joe's hens on his website look so healthy and happy. I'm definitely going to check him out. Any other sources you can suggest?